It’s been such a blessing to review with the group the principles of teaching evangelism. One of the subjects we talked about at length was “What is faith?” The guys talked about this abstract concept using concrete things they understand to illustrate what faith is. One example I loved was crossing a high bridge tied together by vines, they are depending on the strength of the vines to hold them up. If the vines aren’t enough, they will die. That is faith! Another example was selling their coffee in town. They put their entire confidence in one person who takes everyone’s coffee to the buyers. If that person takes off with their money, they lose everything. And so the kind of person they look for is a person of whom they can say, “That person, he is able.” That is faith! Our conclusion on what it means to have faith in Jesus: It means that we are fully confident that His death was cruel enough to appease the anger of God… cruel in the sense that a perfectly righteous person received the worst possible punishment. Our souls’ eternal destinies depend on that one thing. If, for some reason God was not satisfied with Jesus’ death, then we will be lost forever. Because, we can put no hope our own goodness, but we are resting completely on Jesus. In short, Jesus is enough. I often wonder to myself… If I was sent here to minister to these people, how come they are the ones that are such a blessing to me? Royfo added to that that we see from how God worked in the Old Testament what kind of Being He is – His judgment, His holiness, His mercy and grace. Keteng emphasized that we see how God created everything – by His powerful Word – not something we can do. Benny brought out how everything that God ever said would happen, happened. to understand the New Testament. Others mentioned that in the Old Testament we learn the makeup of humankind (body, soul, and spirit), the real reasons why we die, and why sorcery isn’t real. So, why the review? When the Gospel first came to Mibu, almost the whole village trusted Christ. But, there were a few that did not. 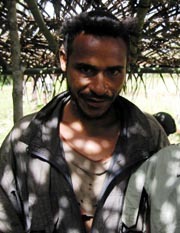 And since then, there have also been people who have moved from the Nankina language group to Mibu village. As these people settled in, some began to cause trouble. The big question in the church has been, “Do we run these people off as would be our custom? Or do we see it as an opportunity? Perhaps God has sent them here so we can preach the Gospel to them?” And so, 4 men have begun back in Genesis 1:1, gathering and teaching those who have not yet heard or understood. Please join the rest of the Mibu church in praying for these souls to be rescued from eternal separation from their Creator. This week the Bible teachers in Mibu are taking their first try at writing their own Bible lessons. Yesterday, ten guys sat around in the office with me thinking, writing, and joking as they began to put their thoughts onto paper. I reviewed with them some of the basics of Bible lessons writing, just as I had learned them. Speak naturally, write out word for word what you want to say, check the material with someone else, etc. These lessons will be taught at their Christmas service. The material is very familiar, but having to use their own notes will help to develop their lesson writing skills even further. Our job isn’t over yet here in Mibu, but with each new skill that they develop and master, I see the need for me becoming less and less. I was blessed reading the following excerpt from one of the lessons they wrote about Jesus coming to earth. The Mibu church has been busy with preparations for her next outreach. Just what goes into getting a group ready to teach? One of the biggest things is simply familiarizing them with the material to be taught, this time from a teacher’s viewpoint instead of the hearer’s. Also important is giving them an understanding of the philosophy behind our teaching. It’s common knowledge that we teach from Genesis 1:1, painting a picture of God through his actions in the Old Testament. But as we teach, there are specific themes that we bring out about the nature of God, Satan, and man. For instance, as we teach creation, we don’t just teach, “On the first day, God created this, on the second day… etc.” We emphasize that in creating everything, God was showing us that He is God. We magnify His awesome attributes, such as His knowledge, and His power, and His love for man. To represent God’s being present everywhere, they draw this picture. As the evangelists prepare to teach, they draw this picture next to any point that has to do with God’s attribute of being present everywhere. Then, as they are teaching, at a glance they can easily and quickly refresh their memories as to the main point they are working to get across. Here’s their simple picture for when they are teaching that God is holy, and by nature his character does not allow him to associate with sinful man. I like their picture for God’s faithfulness. He does what he will say he will do. When we taught in Mibu, this attribute was paramount, as they place a high value on a person who follows through with what they say they are going to do. This is a timeline. Exactly what God says will happen, it happens just like that at a later point on the timeline. The picture they chose to represent the need for trusting in God’s very sure promises to save us from our sins looks like this: It’s a man crossing a river on a log bridge. Here, where this is a common event, the picture speaks volumes! These are only a few of the pictures the teachers use to trigger their memories. As they prepare, they come to a conclusion for themselves which theme or themes are being taught. Then they check their conclusions with the the more experienced teachers who have been given a list of all the lessons and their respective themes. This seems to really help the guys “own” the lessons they teach. During school testing, Joey spent the 10 days plugging away at work in Mibu. It was a good chance to try and catch up on all sorts of things. The day we returned from testing, the Mibus were able to use a helicopter supply shuttle to also fly in Sivi, who has been very sick and was in the little clinic on the coast in Saidor. He is dying from meningitis (a severe complication from malaria) and his family wanted him home to finish looking after him and bury him here. It has been hard for all of us to see him like this; but the Mibu church is rallying around him and praying with him and his family. We had a communion service on the Thursday before Easter, that was led completely by the Mibu leaders. It is so refreshing to see them so thankful for the eternal life they have been promised. We worshipped together while Keteng led us through the story of the last supper. After the communion service, worship continued through the evening and went all the way until the next morning! We have been so encouraged with the evidence of God working in their lives. He is working in our lives, too, and teaching us so much. Thank you for your love and prayers for all of us! Royfo was among the first here in Mibu to trust in Christ, and was also a graduate of the first literacy class. Royfo was married just last year to a young girl from Mibu named Oolaipe. (pronounced oo-lie-pay). We recently heard that they are expecting their first baby soon! Since Mibu people believe that pregnancy starts when the mother first feels the baby kick, it’s harder to guess at a due date! Royfo’s heart and enthusiasm for the task at hand is an absolute joy. Though I would never dampen his zeal, I believe reality is that it will take many, many more missionaries of any and all nationalities to completely reach the rest of Papua New Guinea. Pray with us for more laborers for the harvest! People like Royfo who have just met their Lord and Savior and cannot wait to share Him, as well as people who have known God for many years. Awesome things are still going on over here in our corner of planet earth! Not the least of which is that we have started teaching in Tariknan, a village about 3 hours away from Mibu. The teaching been going on for two weeks now, and we have taught up through the fall of Adam and Eve. Unlike the evangelism phase in Mibu, where we missionaries were the only teachers, in Tariknan much of the teaching is being done by the Mibu believers! Geoff and I (Joey) are there with them, partnering with them as they reach out to their own people with the message that they have taken hold of themselves. These new believers/teachers are filled to the brim with excitement seeing evidence of the God of heaven actually working in their own hearts and lives. On Monday the teachers expressed concern that 3 of the leading men of Tariknan were not attending the teaching. We prayed together about it, and wouldn’t you know it, the next day one of the 3 of the men that was prayed for showed up, and has been attending the teaching ever since. Not only is he there, but he is obviously cut to the heart over the message he’s hearing. It took several days to teach on the fall of man and God’s promise of a Deliverer. As we prepared together for teaching, we prayed that God would give each of us wisdom as we taught. It is so awesome to see the Mibu teachers presenting the material, not straying from the outline, but adding their own culturally relevant illustrations that the Holy Spirit has given them. Afterwards we thanked God for his faithfulness in giving us the words to make the truth relevant. They are growing by leaps and bounds even while God is using them and stretching them as they reach out. One Mibu teacher, Kivisi, closed a lesson with this illustration: He placed two pieces of paper on the ground about 6 feet apart. He then said, “One of these papers is light, and the other is the darkness”. He then showed them that all these years they have been living in darkness, but now that the Word of God is come, they are beginning to step towards the light. And he promised that when they get to the end of the lessons, they will see clearly as in the light. What a way to end this lesson in which God promises to one day send a Deliverer to save mankind!! What an effect the Word of God is having in Tariknan, the last village in Mibu land without the Gospel! These Mibu teachers are spending part of their days just hanging out with the guys in Tariknan, answering questions about the lessons. After the series of lessons about the fall of man, the Mibu teachers reported that the Tariknan people are to the point of tears over the sinfulness of all mankind, and their own inability to buy off God’s anger with money, ritual, or promises to obey. We often share with the Mibu teachers, “We’ve never seen God with our eyes, but we have seen the evidence of Him at work. When he answers our prayers as He is so obviously doing in such magnificent ways, we see the evidence of His existence.” Meanwhile, back at the believers meeting in Mibu on Saturday, Sesi got up and addressed the believers during testimony time saying, “It is God and only God who is causing some from amongst us to proclaim His word without fear.” What a joy to hear this newborn babe in the Lord giving the credit where it is truly due!! 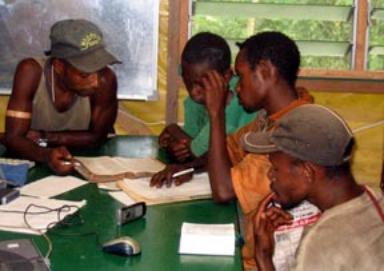 We have started using the literacy classes to train some of the guys as future teachers! It is amazing for us to sit back and watch them doing a much better and more natural job of teaching than we ever could. Please continue your prayers for them and us as we take these little steps in preparation to hand the literacy program over to them completely.